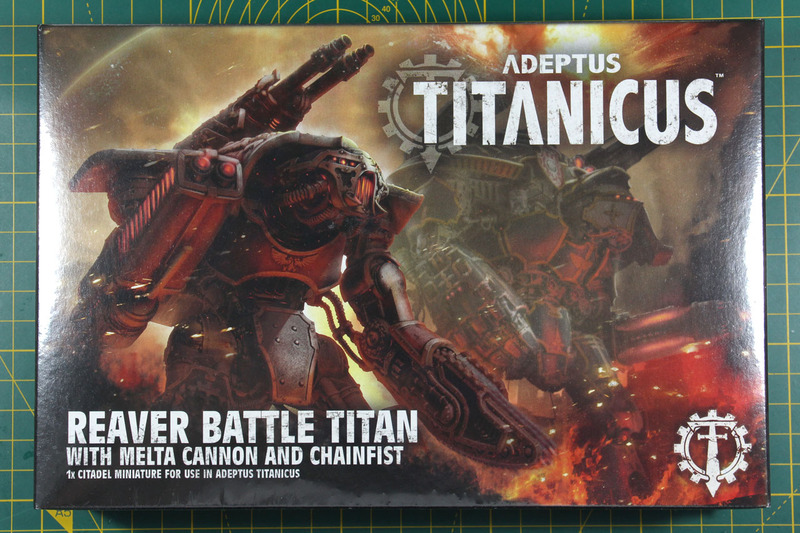 Games Workshop starts into the new year with a new supplement for Adeptus Titanicus, Titandeath. 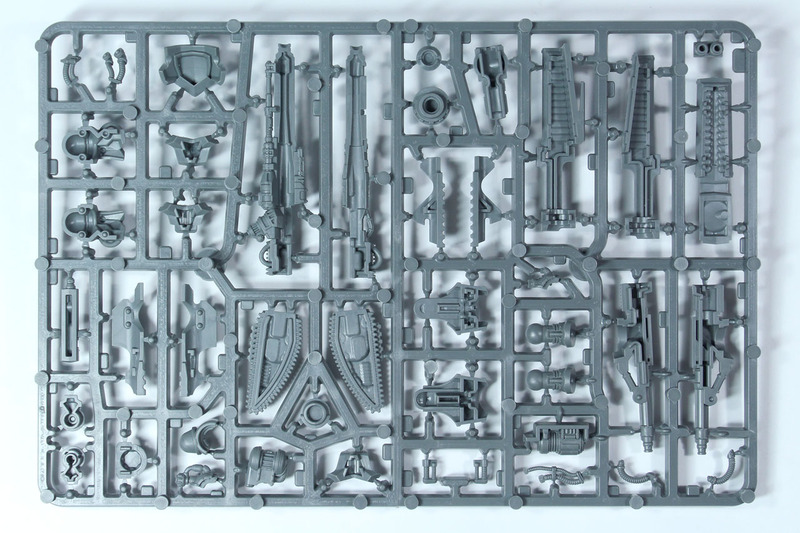 Along the release of the book, you now have the chance to buy the weapon sprue from the Warlord Titan with Plasma Annihilator and Power Claw, and a Reaver Titan with Melta Cannon and Chainfist, that we're going to unbox today. 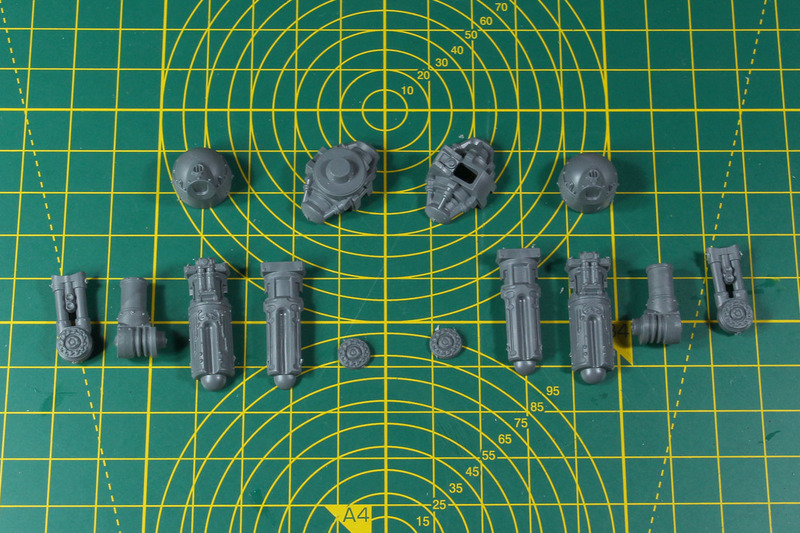 You'll find the reviews on the earlier released Reaver Titan with Gatling/Laser Blaster and Power Fist, Warhound Scout Titans and both Warlord Titans on my blog as well. 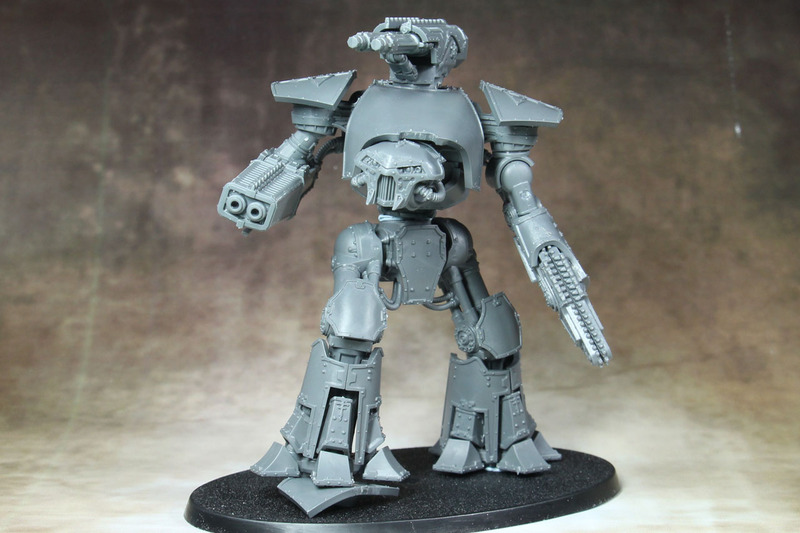 The Reaver counts as an medium class battle titan, almost twice as tall as a Warhound but still a lot leaner and smaller as a Warlord. 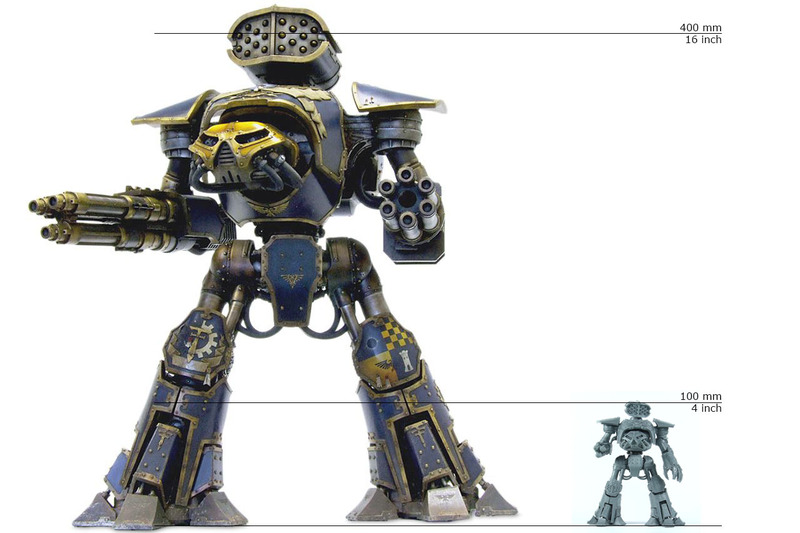 Similar to the Warhound and Warlord, the Reaver has different produced patterns, but more dominantly different Marks of its design. The design of the Reaver is quite consistent, did not change that much during the decades, "just" more modern. 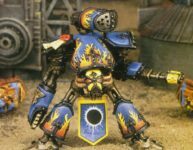 A Lucius Pattern was produced by Forge World for Epic 40k in the late 90s, but that is a relatively unknown fact. It is more commonly know for the different Marks of the Mars Pattern. A Reaver is commanded by a Princeps and between 2 to 5 Moderati (Primus, Steersman, Navigator, Sensorius, Oratorius), along with an extended crew of multiple servitors and such. 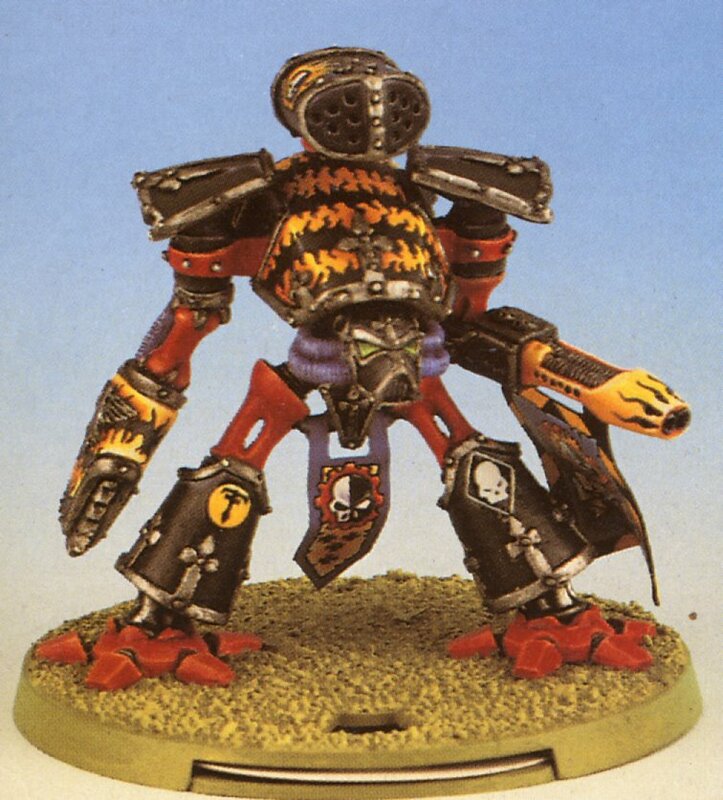 Models of the Reaver were available in different Marks for a long time and in the lore it is mentioned, that it might even pre-date the Warlord Titan. 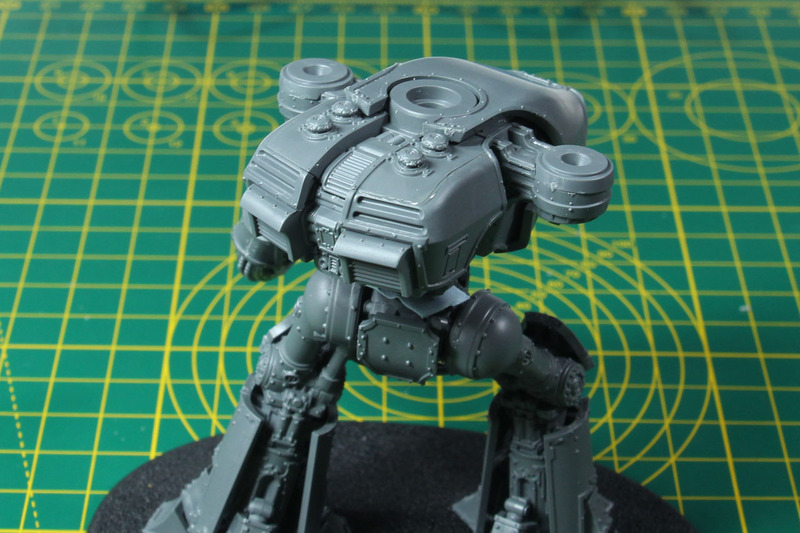 As medium battle titans Reavers are typically deployed to support conventional forces in a shock or assault role, using the flexibility of the war engine to the maximum. 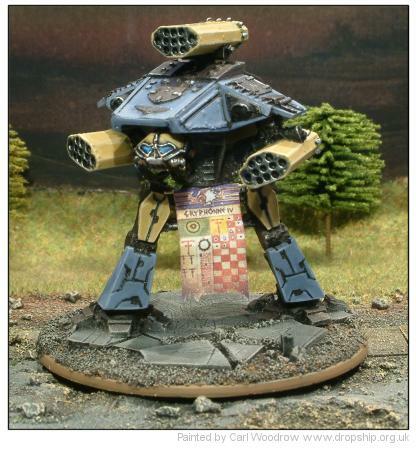 Beside its taller size, the Reaver benefits from an additional weapon mount on top of the carapace, often used for a missile launcher. The here seen design is classified as a Mars Pattern from the Late Great Crusade era. 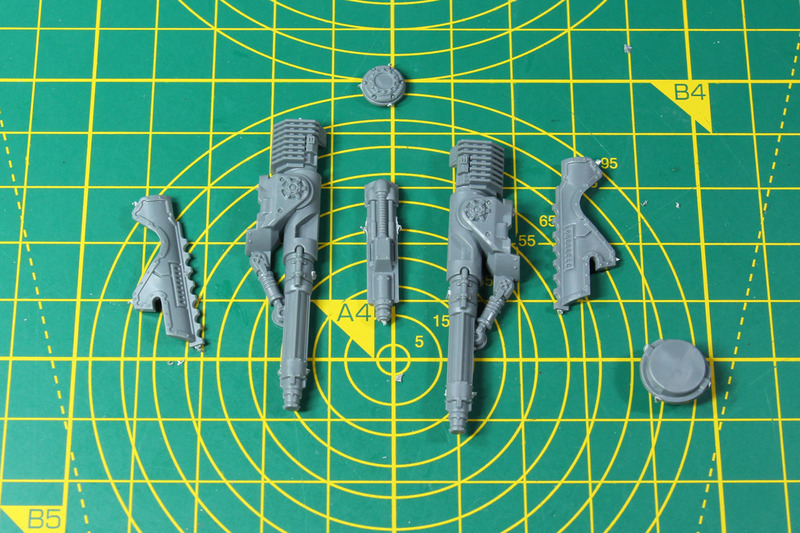 A Reaver is usually armed with two from the following arsenal on the arm mounts; Gatling Blaster, Laser Blaster, Volcano Cannon, Melta Cannon and Titan Power Fist, and in addition one of the following mounted on the carapace; Apocalypse Missile Launcher, Vortex Missile, Plasma Blastgun, Turbolaser Destructor, Inferno Gun or Vulcan Mega-bolter. 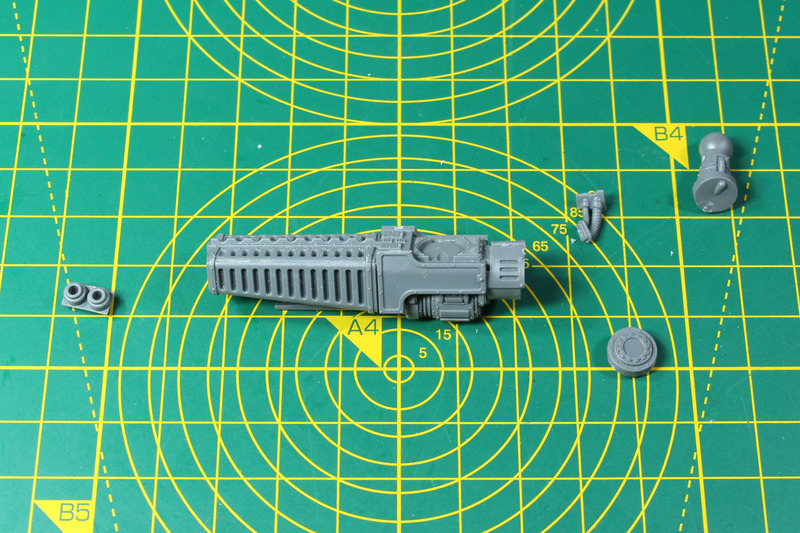 The most common configuration for the Reaver is an Apocalypse Missile launcher with a laser blaster and gatling blaster, as covered with this kit. 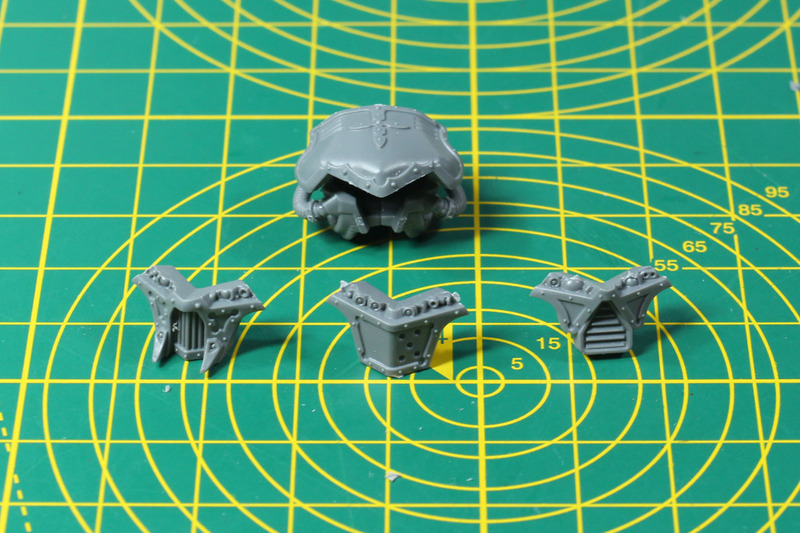 This kit gives you the option to build a Mars Pattern Reaver with an Turbo Laser Destructor on the carapace, a Melta Cannon, Vlcano Cannon or Titan Chain Fist for the arms. 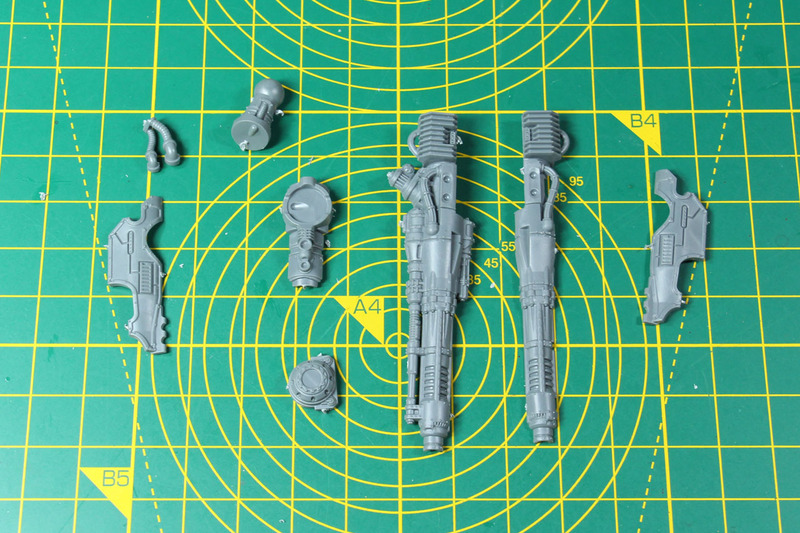 This kit is the second weapon load out variant for the Reaver, as late 2018 another Reaver kit was already available with an Apocalypse Missile Launcher on the carapace, a Laser Blaster, Gatling Blaster or Titan Power Fist for the arms. 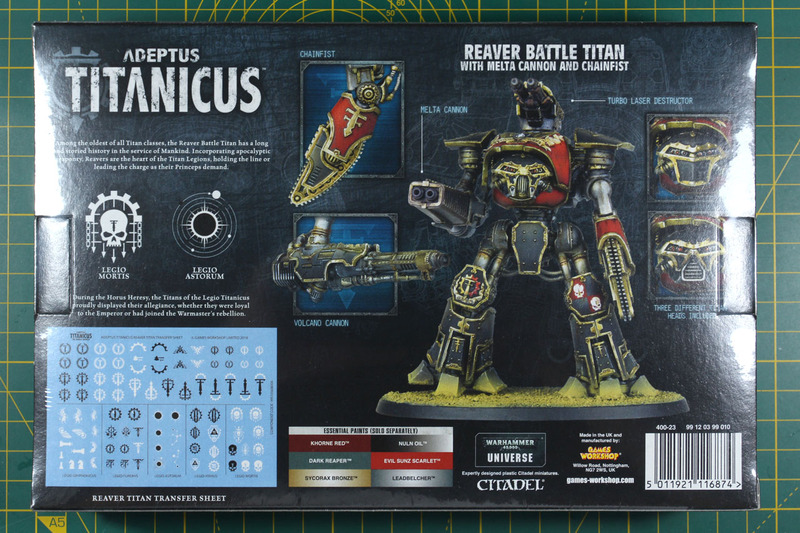 The rules for using the Reaver Titan with Adeptus Titanicus can be found in the Adeptus Titanicus boxed set. 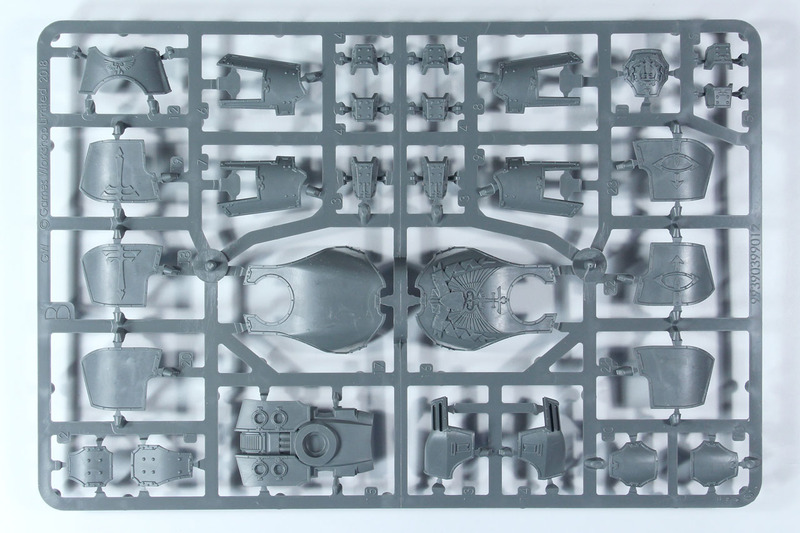 This plastic kit is set at the price of 45 EUR by Games Workshop, unfortunately there is no information on the number of pieces included (as were with the other kits). 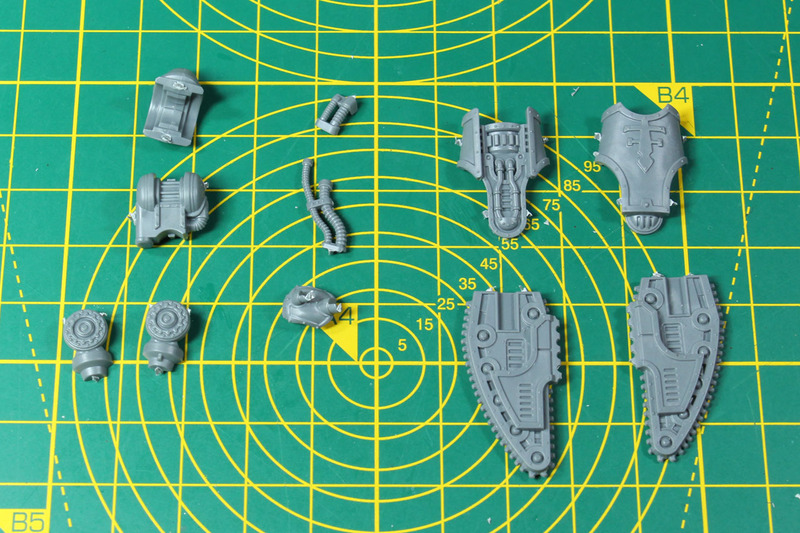 The parts for the Reaver are spread among 3 medium sized grey plastic sprues. The sprues are quite filled with little to no empy spaces. Casting is up to a high quality, as you would expect from a recent model, so a lot of sharp details and a only a few mould lines. 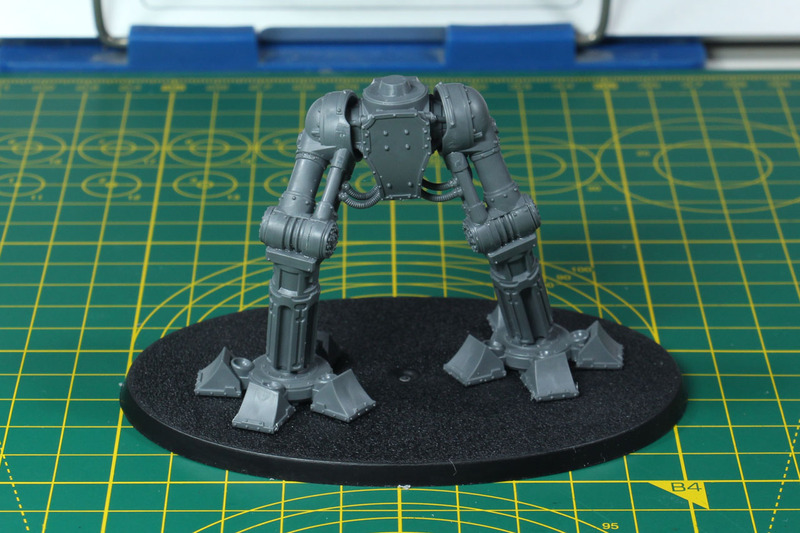 Similar to the Warhounds, this is not an easy-to-build or push fit kit. 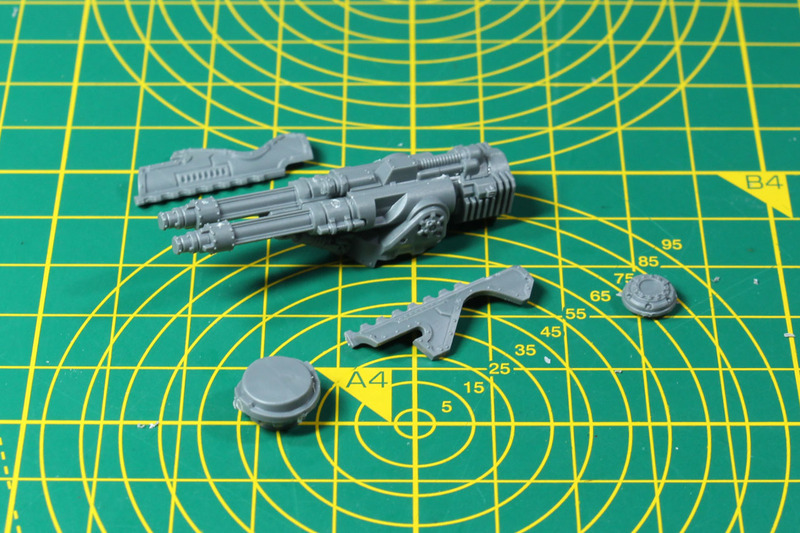 A regular one multi piece kit, where you will need plastic glue to assemble the miniatures. 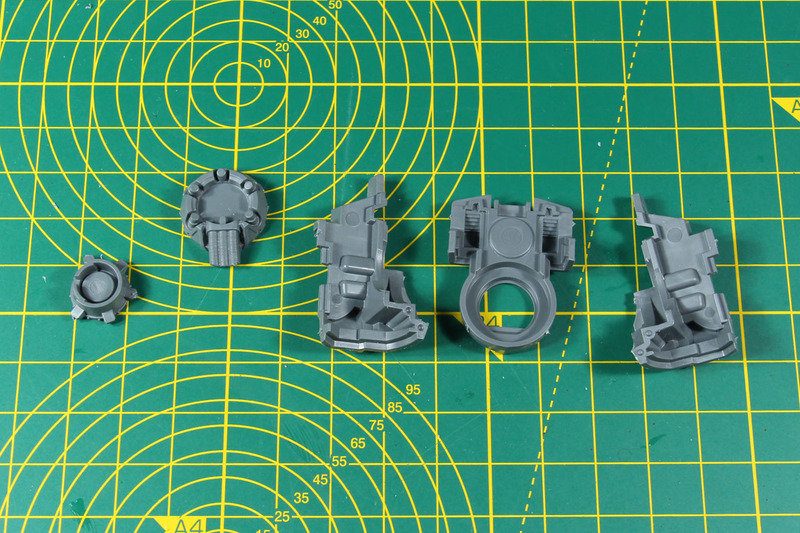 As mentioned above, this kit of the Reaver Battle Titan "only" covers three different weapon systems, along with the turbo laser destructor on top. 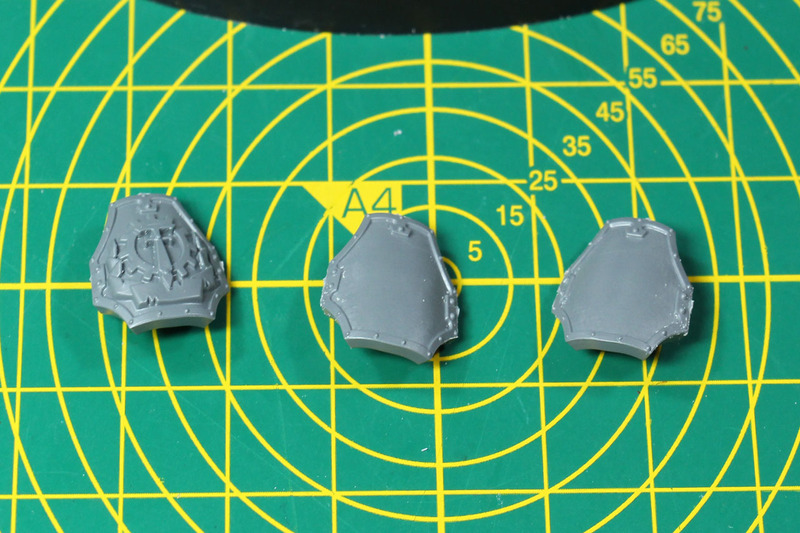 The armour plates and carapace are included in multiple design variants, to cover loyal and traitor legions. 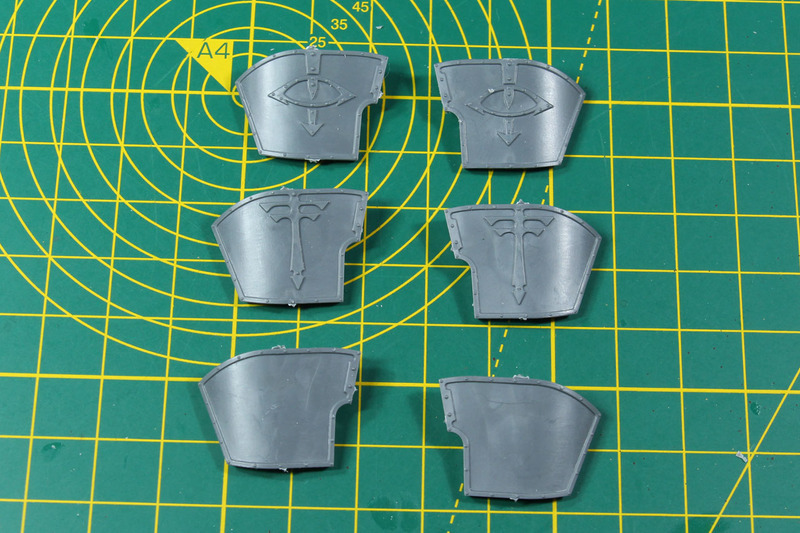 The decals cover insignia for five different houses of the loyal titan legions, Gryphonicus, Astorium and Atarus, and the traitors of house Fureans and Mortis. 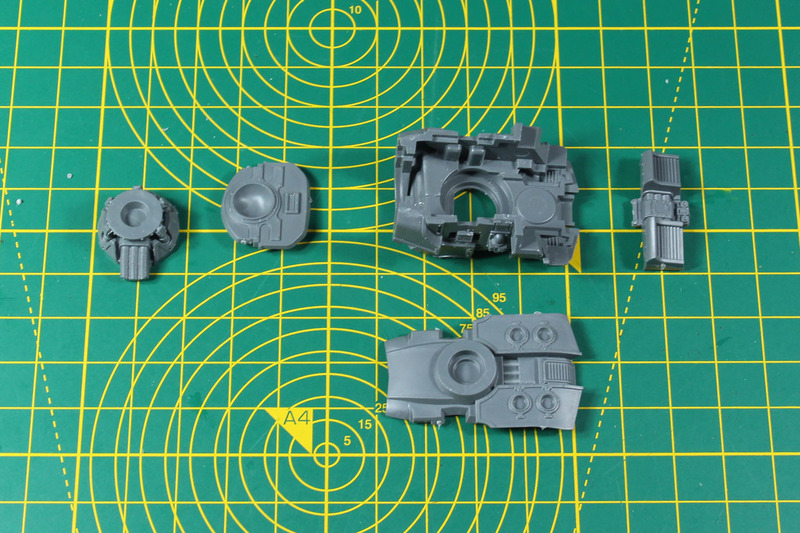 It is the same decal sheet as for the other Reaver kit and it covers the same houses as for the Warhound Scout Titan, but the decals are different in design and size, to fit the armour plates of the Reaver. 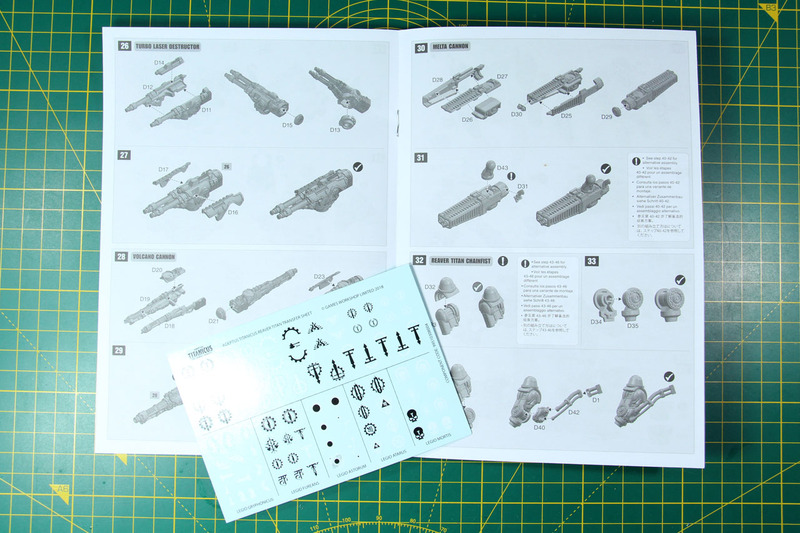 The kit includes a multipage construction leaflet and a 105mm oval base. 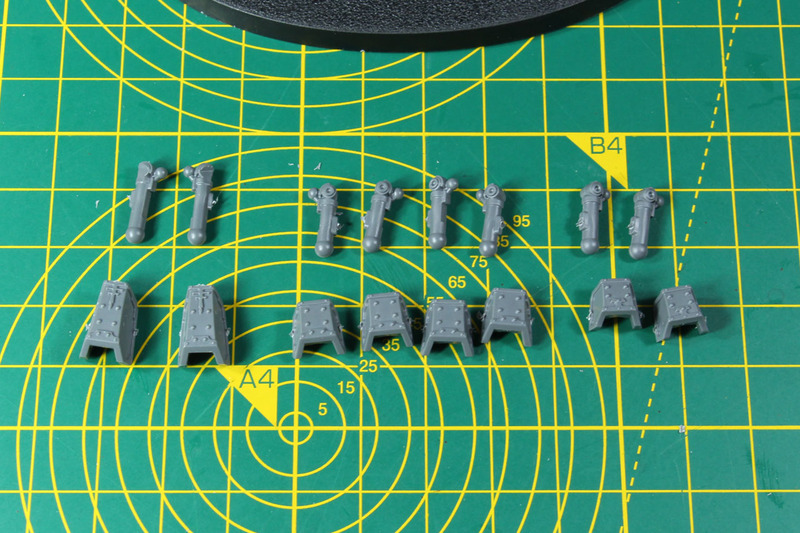 The sprues are numbered A, B and D and are the same size as the Warhound sprues. 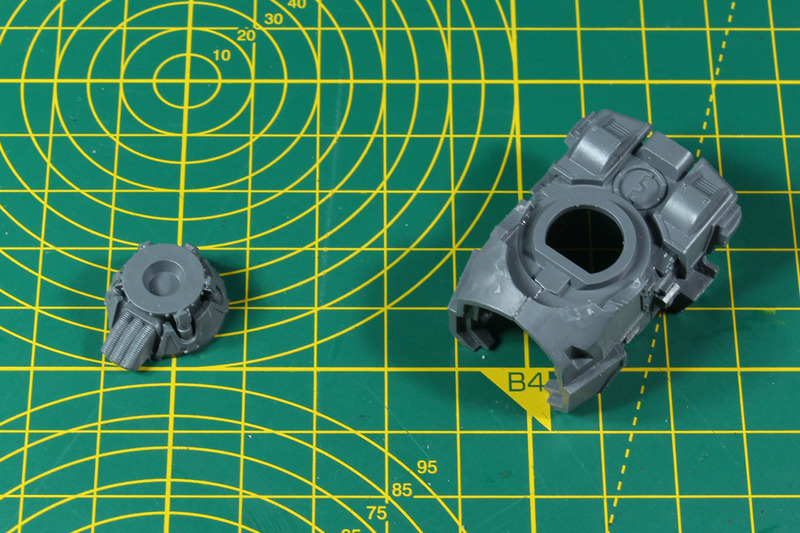 They pick up the mostly mirrored design, which makes it easy to find the parts (and counter parts) during assembly. 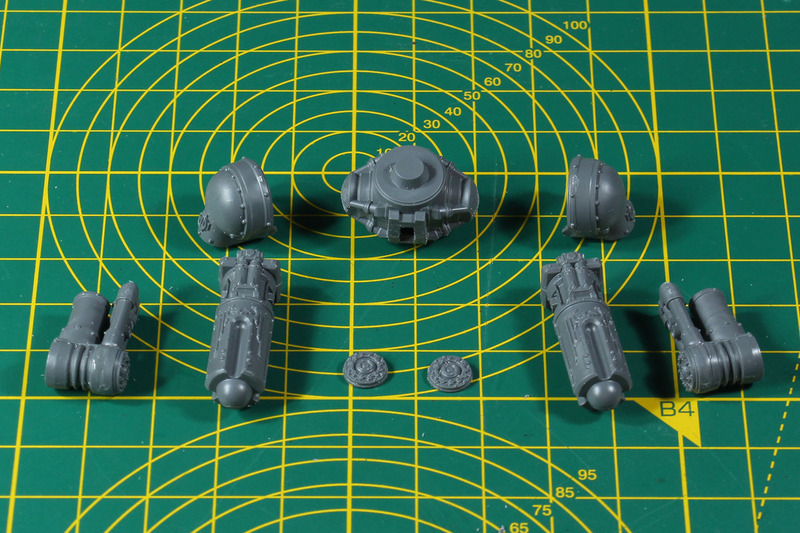 This kit shares the spures A and B with the other Reaver kit, replacing the weapon options included in sprue C by the newly added sprue D. Compared to the Warhound the Reaver design is more loyal and neutral, as the only traitor insignia are the Eye of Horus on the shoulder plates. The remaining alternate / "non"-loyal pieces are kept empty, but without the spikes around the edges, that the Warhounds cover. In case you want to build a traitor Reaver, I strongly recommend using the Chaos Reaver by Forge World as a reference, as the corrupted look is very stunning and sinister. 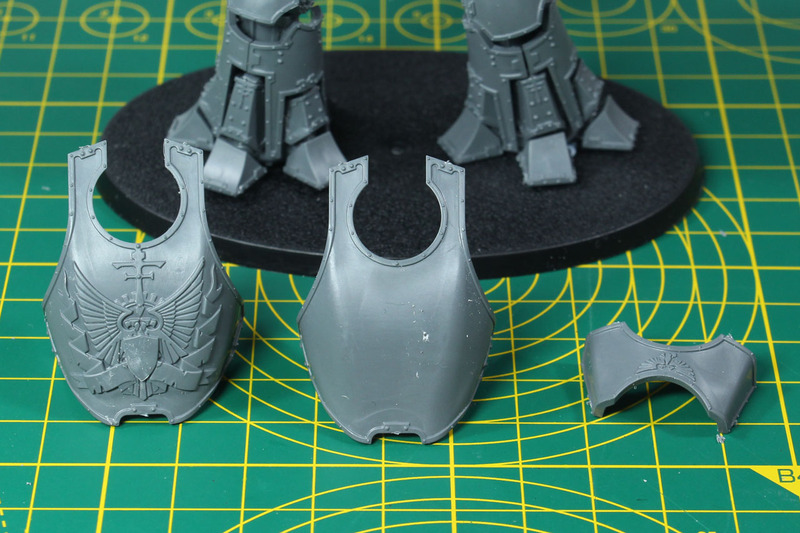 But the head options in this kit suit the traitor legions better than the regular Mars pattern head. The titans are build from the bottom to the top, so similar with the tanks that I introduced here, we begin with the parts they stand on - their legs and groin. 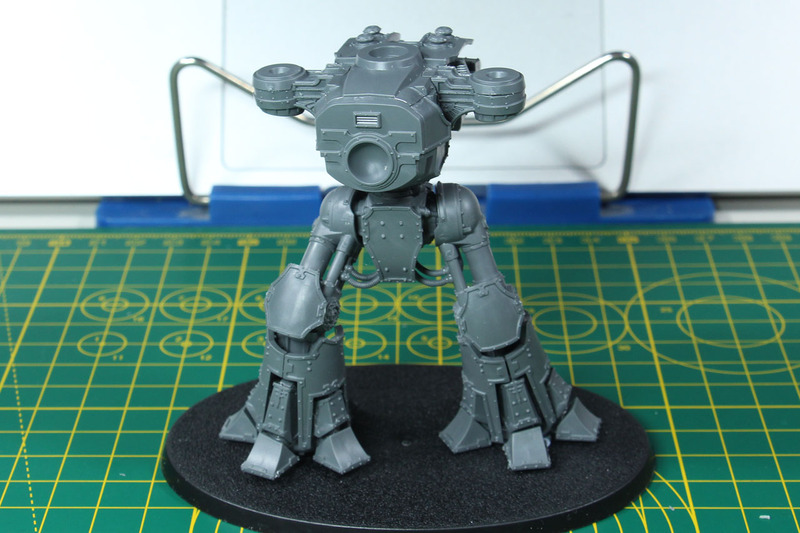 The taller Reaver build is much more flexible in the positioning than the pre-posed legs of the Warhound. The legs look like hydraulic cylinders, with rods around them to give them the ability to move more flexible. Thus enabling more dynamic poses for the kit. It makes sense to just prepare the individual parts and only glue them in place once you are sure or have a vision about the final position. I used blu tac to try out a more dynamic pose, than with the last build. 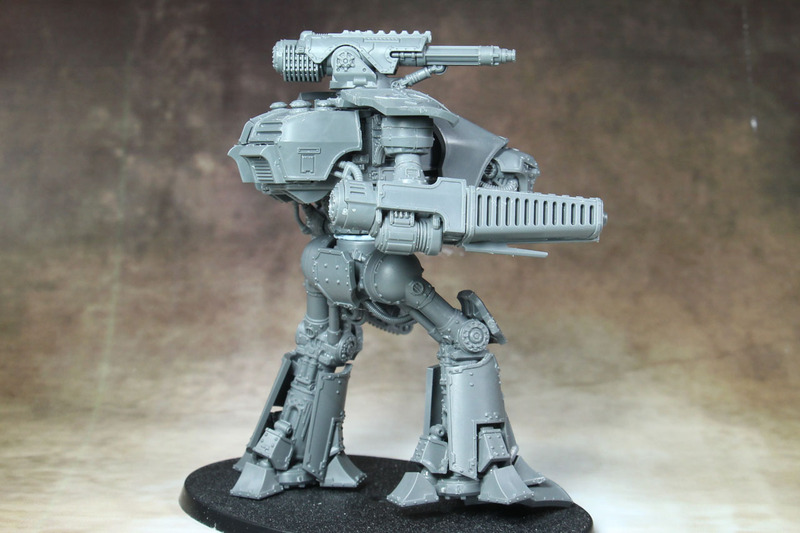 You could give the Reaver a walking pose or have one of the legs lifted / following. 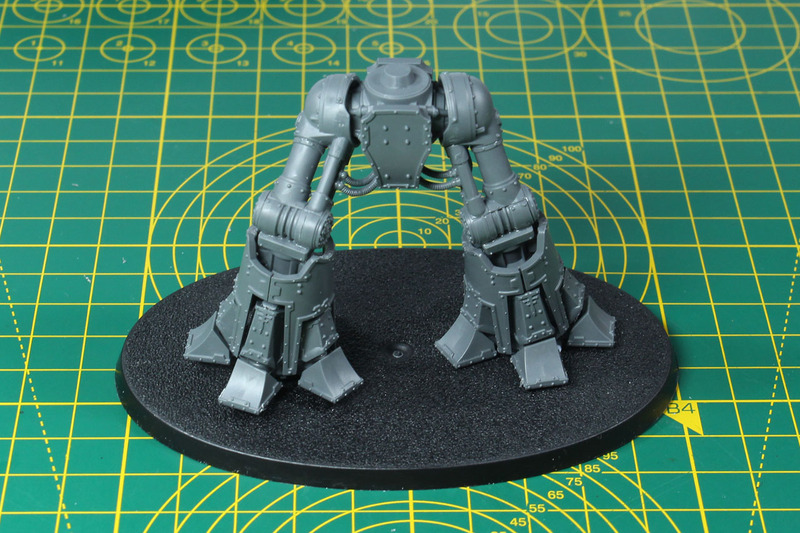 As my other reaver has the left leg in front, but more of a regular standing stance, I went with the right leg towards the front and a bit more bended and lifted knee. 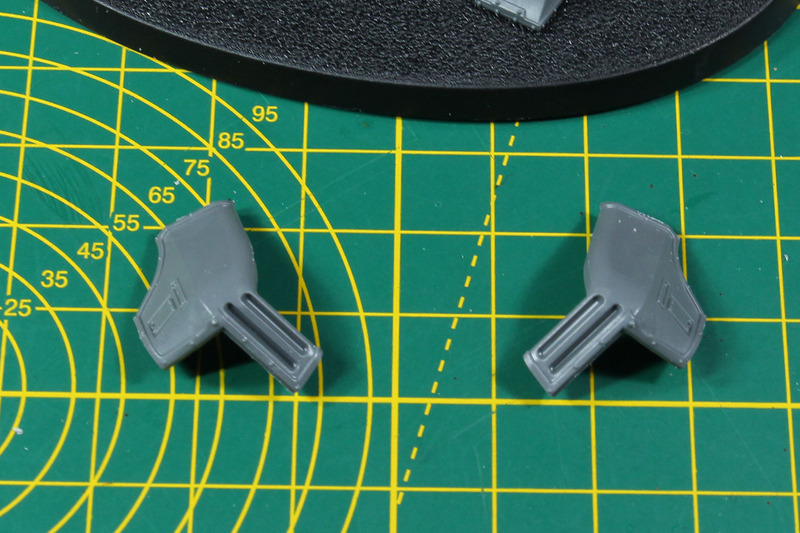 Once again, the feet are single cast parts, so in case you want them to be more dynamic or adapting towards the ground, you could cut them with a cutter and reposition / align them. A bit more demanding are the linear drives around the ankles. 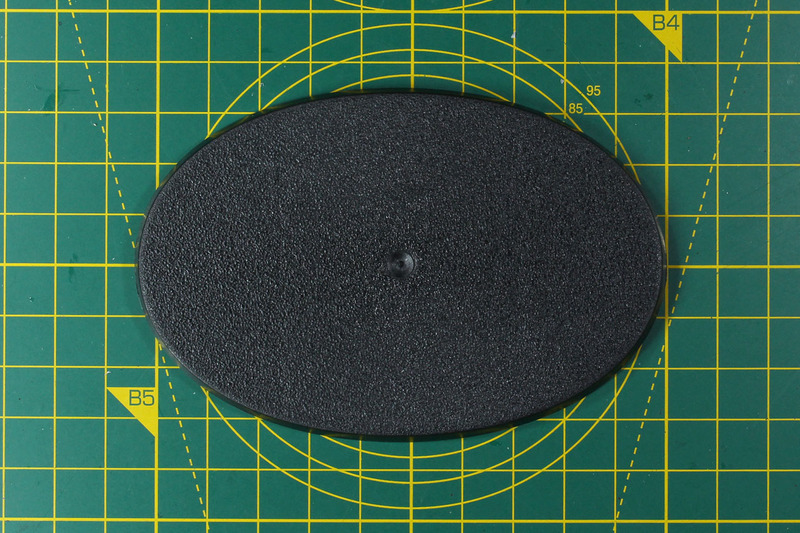 These come in three different sized and are covered with armour plates. 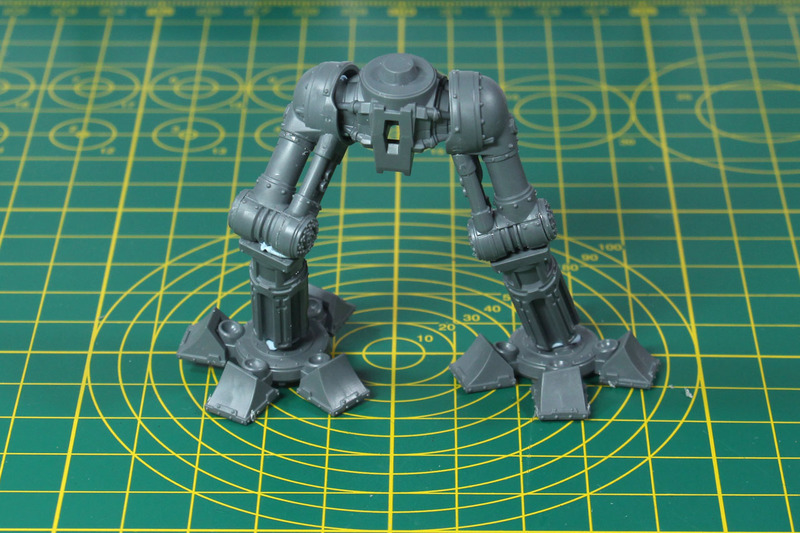 As the lower legs have embedded rails, you are quite free to position them, for example for the mentioned above walking poses. Just make sure to not angle them to extreme, as you might have troubles adding the lower armour plates around the pistons. 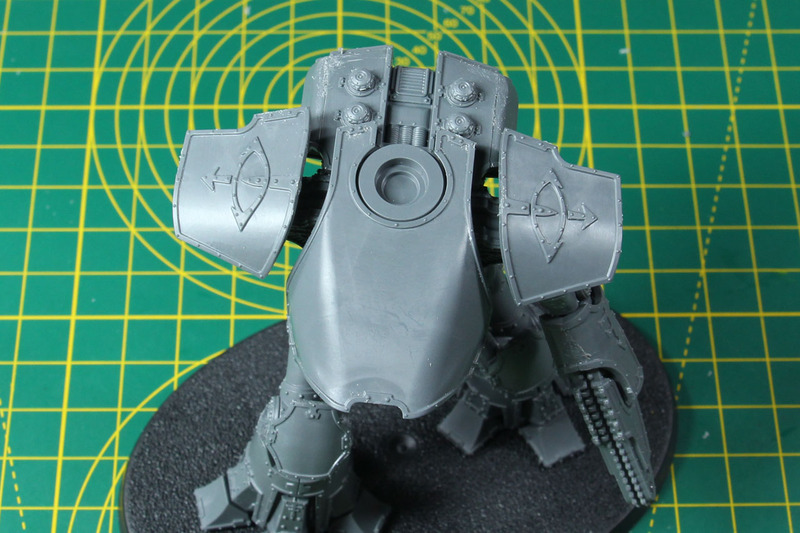 Depending on how you want to paint them, you can add the armour plates now or leave them off until the last steps, so you can prime and more easily paint the metal parts of the Reaver. 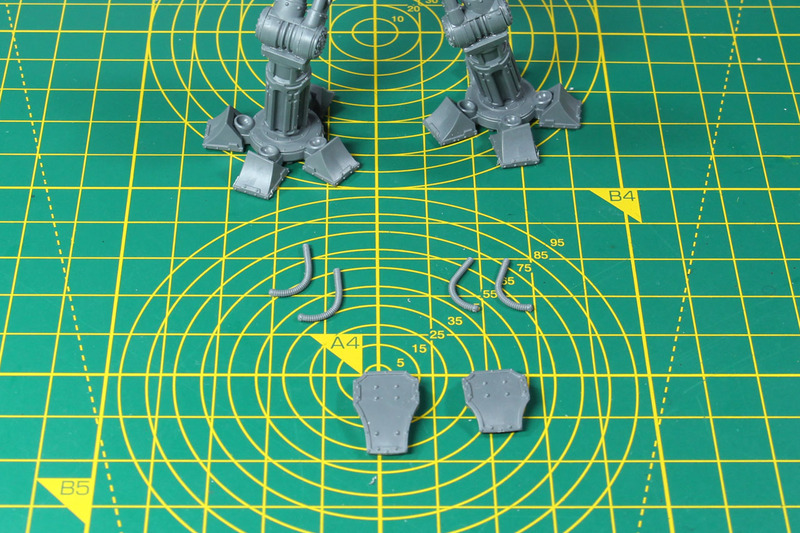 The knee pad is either blank or covers the Opus Titanicus insignia. 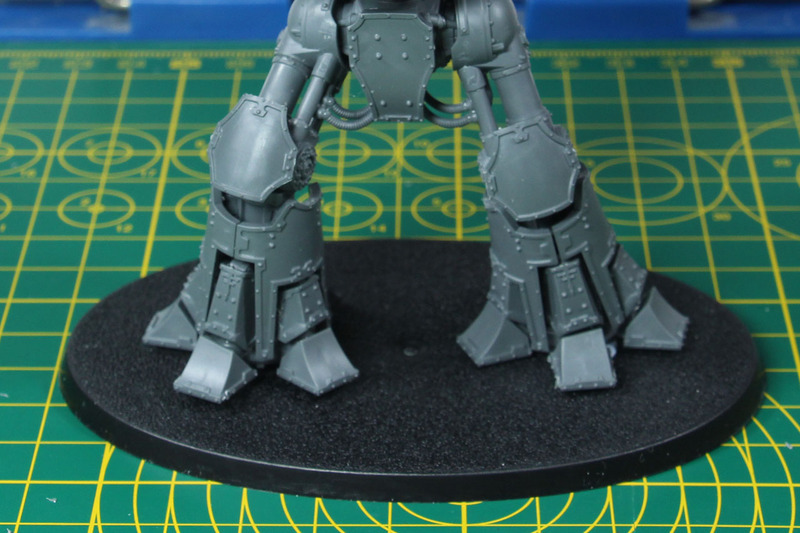 As this one is going with a traitor titan legion, I left both knee pads blank to have the space for free hands or decals. 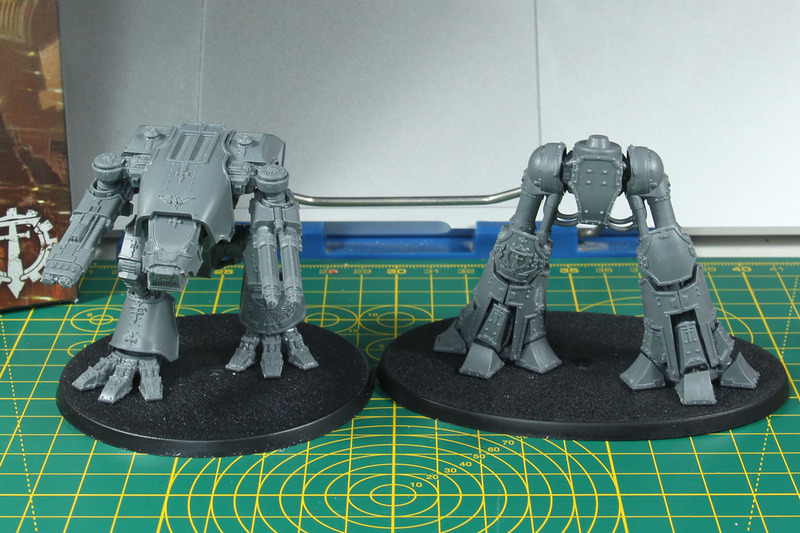 To give you an idea of the size midbuild, here's the comparison with the Warhound Scout Titan. 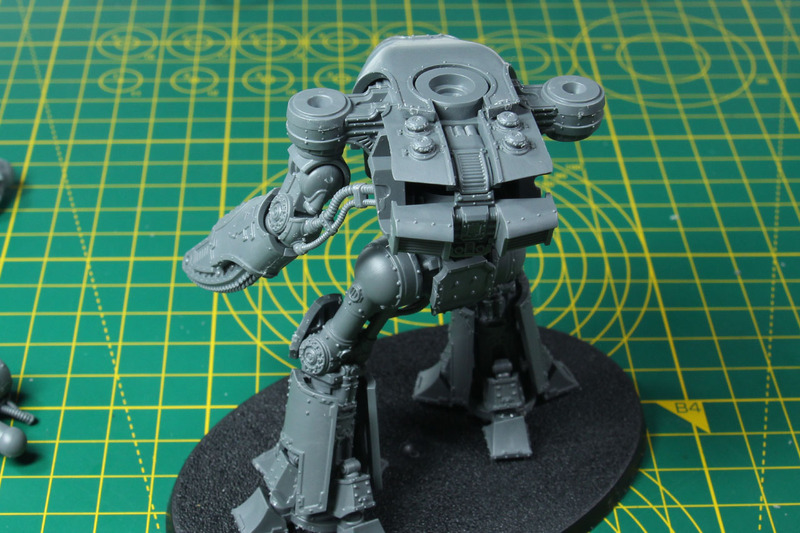 The Reaver's hips are already as tall as the Warhound's shoulders. 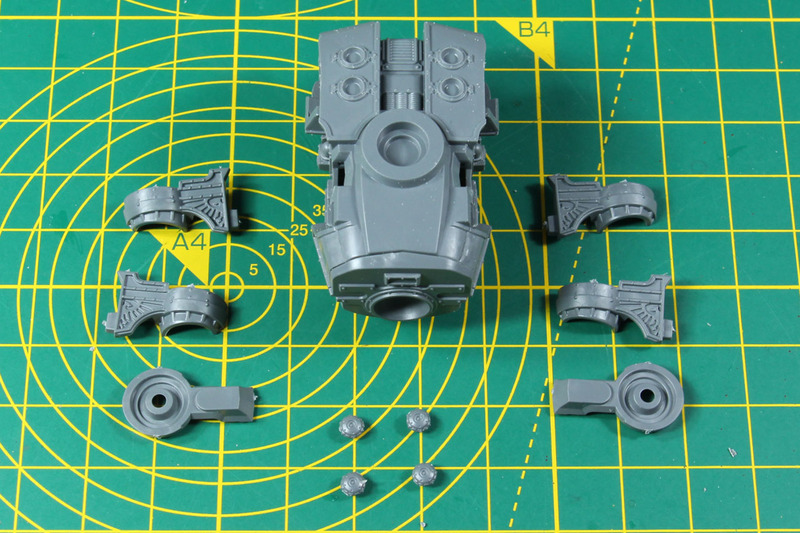 As the parts for the upper body of the Reaver has no optional or moving parts, it is exactly the same as in the other review. The corpus is similar to the Warhounds, hunched, but a good portion larger. The weapon mounts of the arms are T-shaped on the side and on top of the power plant you can see the four void shield generators. 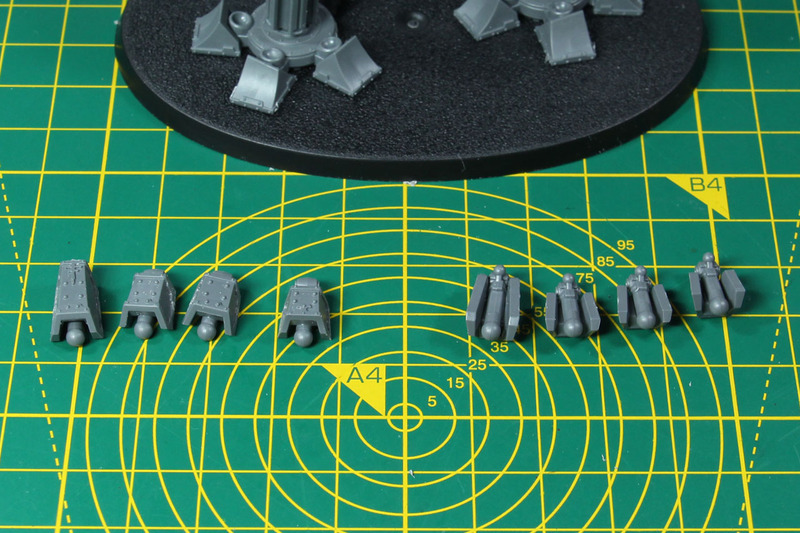 The back part of the carapace armour is added later, as the pipelines of the weaponry are guided towards this area. But the upper back and chest armour is to be added next. There is a highly detailed with scrolls and banners, along with a sword, the other one blank, for your own design by brush or using the decals. The upper body is just kept in place with a bit of blu-tac and not glued. I suggest that you glue it only after you have painted it, as it makes handling much easier during that part. Once again, to stay with the traitor style, and have more room for alternation, I went with the clean / clear carapace. 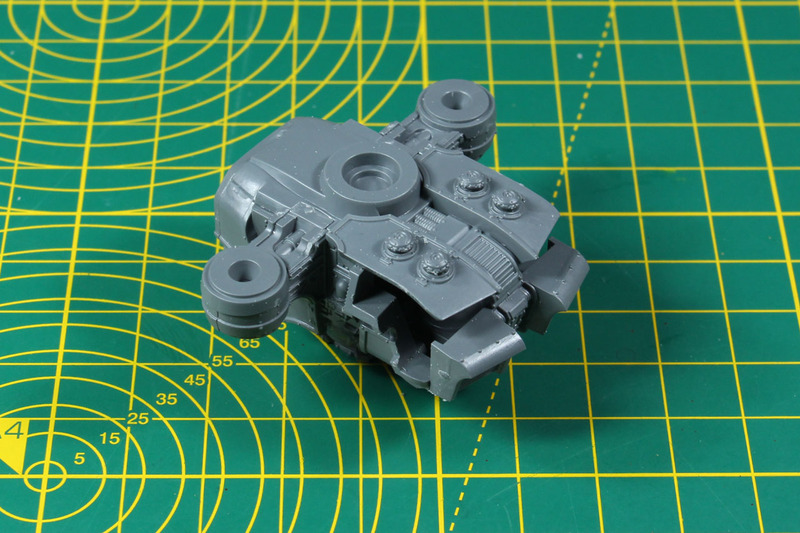 Now we're starting to use the new parts from sprue D, beginning with the Head. 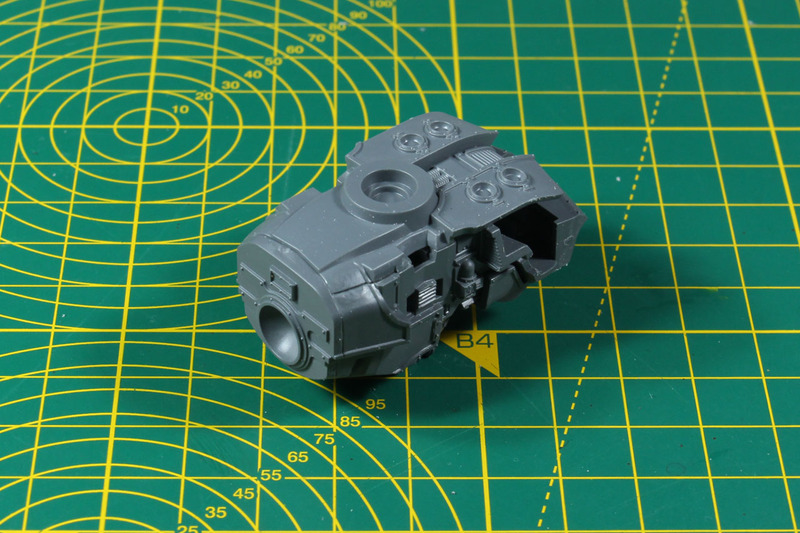 The ball joint on the back gives you a bit of variety with the position or the direction the head looks. 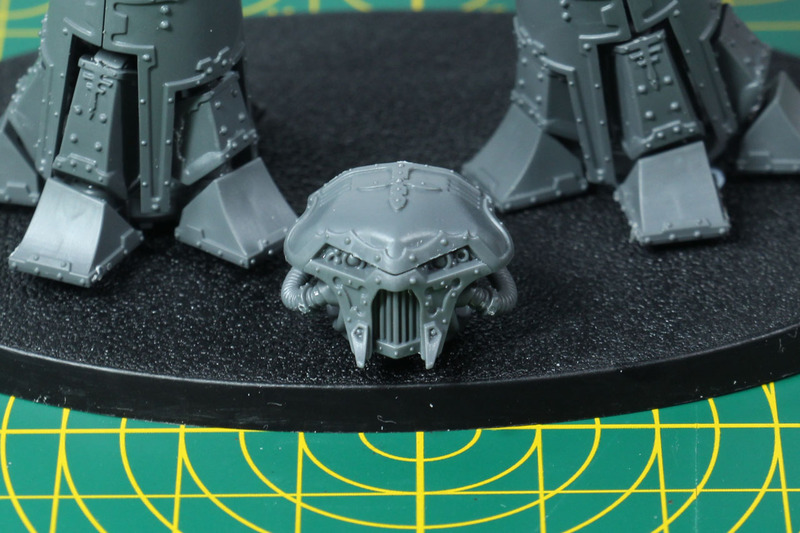 Unlike the other Reaver kit, this one has three different masks, and all of them look quite sinister. I like the variant with the small tusks, has a certain chaotic / corrupted look to it. The third facemask is a clear nod to the old design of the Reaver in the early 90s/ late 80s. 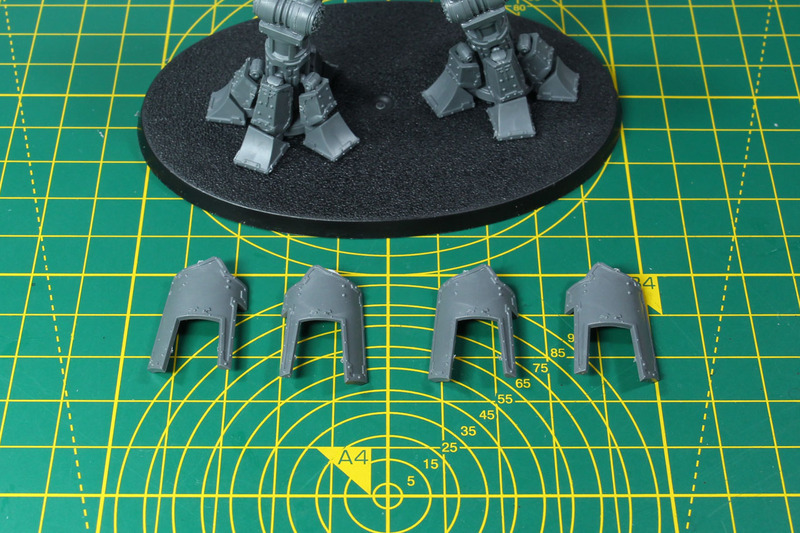 Next up with the weapon systems, available in this kit, beginning with the carapace weapons. 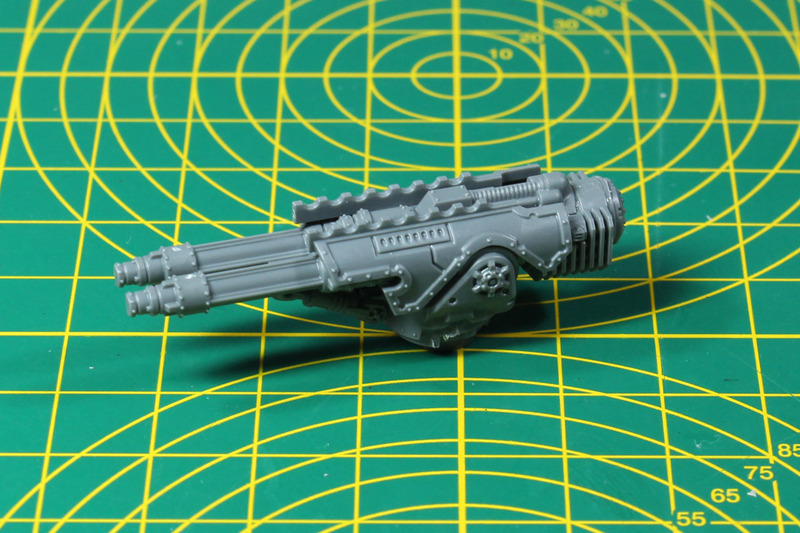 The Turbo Laser Destructor is the doube barreled variant of the thriple barralled Laser Blaster, that is an available main weapon arm setup of the Reaver. If you can get the bits, you could field a Reaver with all laser weaponry. 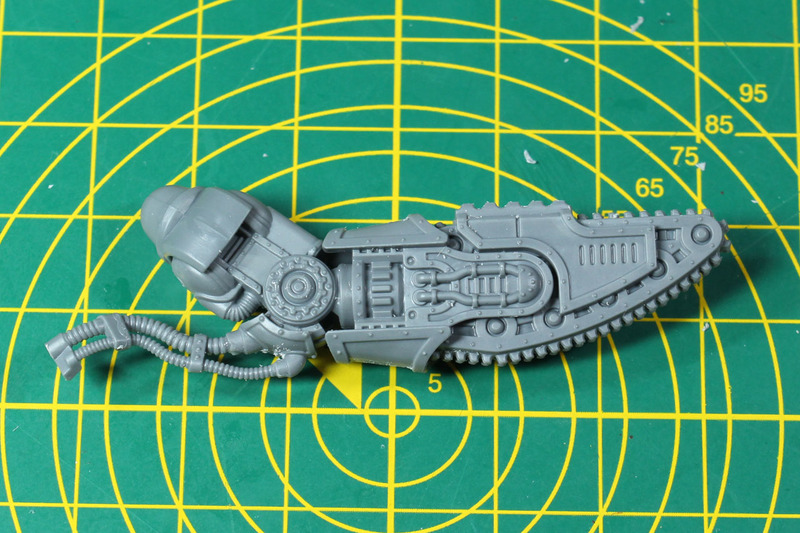 The chain fist of this kit is another weapon option taken from the early days of Epic / Space Marine. 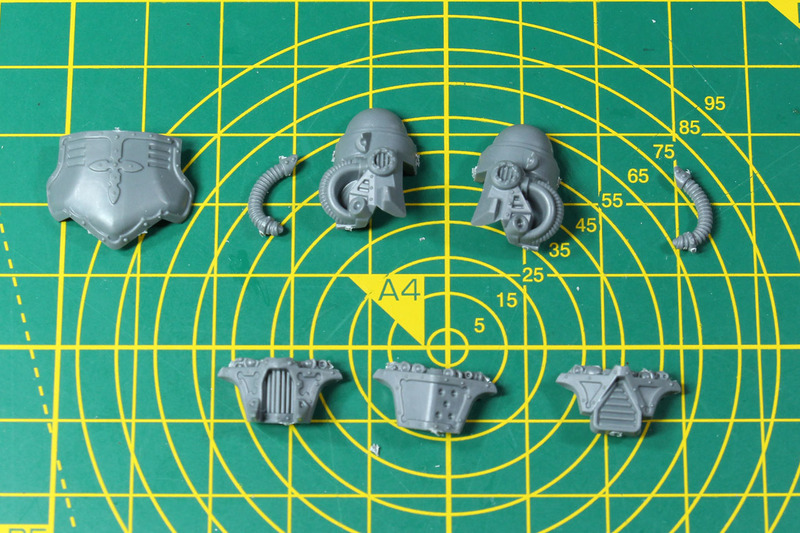 Some of the Warlord / Reaver heads even had a chain fist as weaponry in their heads, for close combat. A bit silly, I know, but those were the old days. The close combat chain fist can be build for the left and right arm, depending on your favorite position. Other than that, no options or variants. 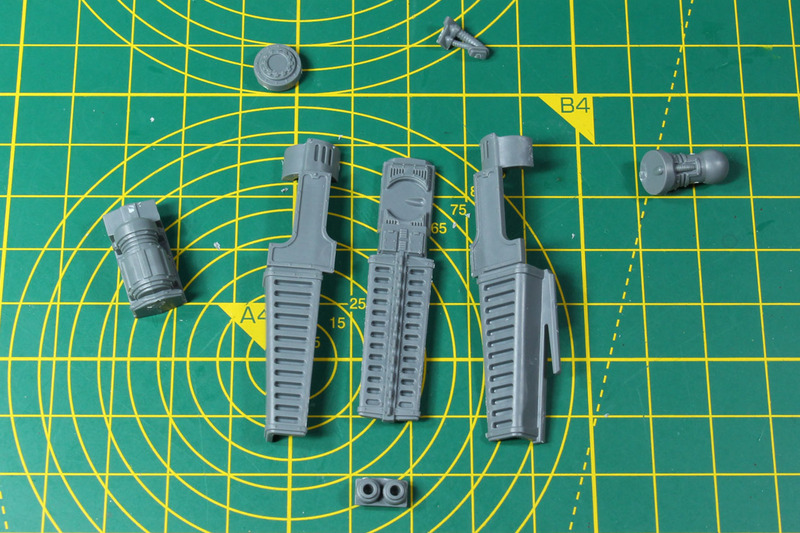 This kit adds two further weapon options to the two other already available gun systems of the Laser Blaster and Gatling Blaster. The first one being a Volcano Cannon. 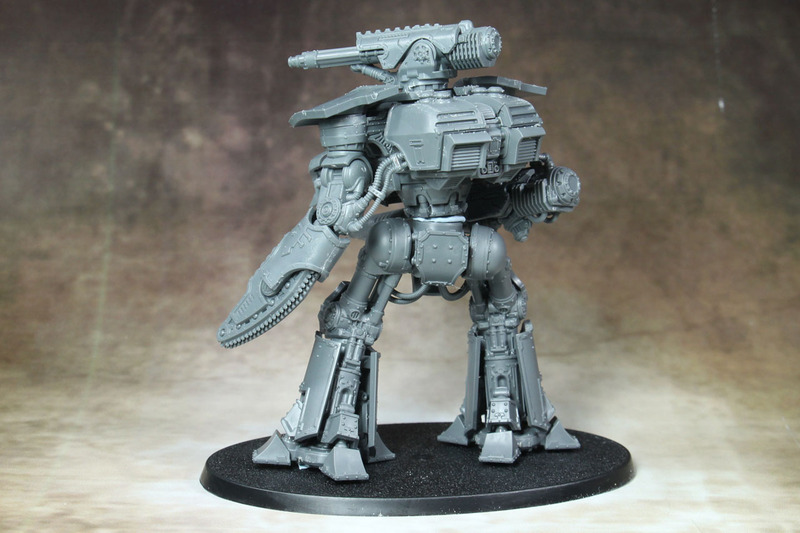 Yes, that is the same weapon system as on the Warlord Titan, but in a more compact build. And for my taste, the most iconic gun weapon for the Reaper, the Melta Canon. Both, the Melta and Volcano can be build for the left or right arm. Due to the ball joint you have a certain degree of flexibility in posing them. You can mix the three weapon options as you like, going with close combat on the right instead of the left or use gun systems on both arms. 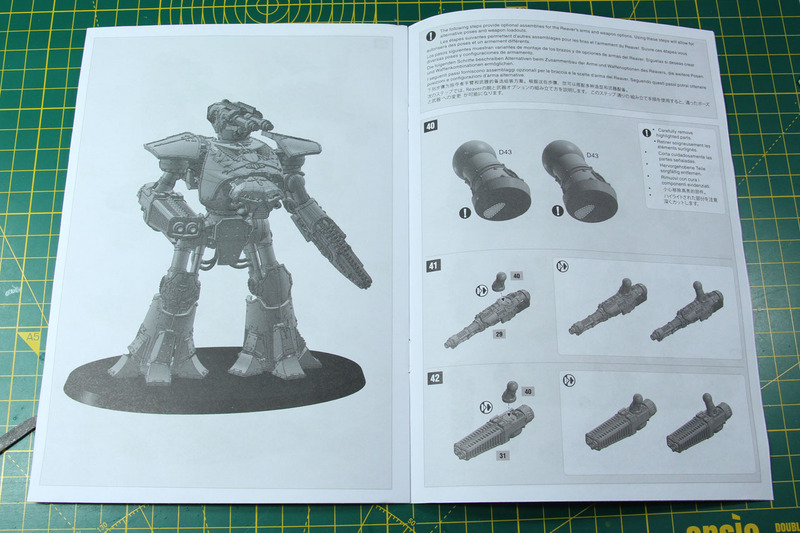 The back pages of the instruction cover alternate poses and angles for the weapons, some of them need a bit of modification towards the regular parts or not using the weapon pipelines, as they limited the angles of the mounted weaponry. But it would be easy to use a bit of wire or guitar string to replace those. 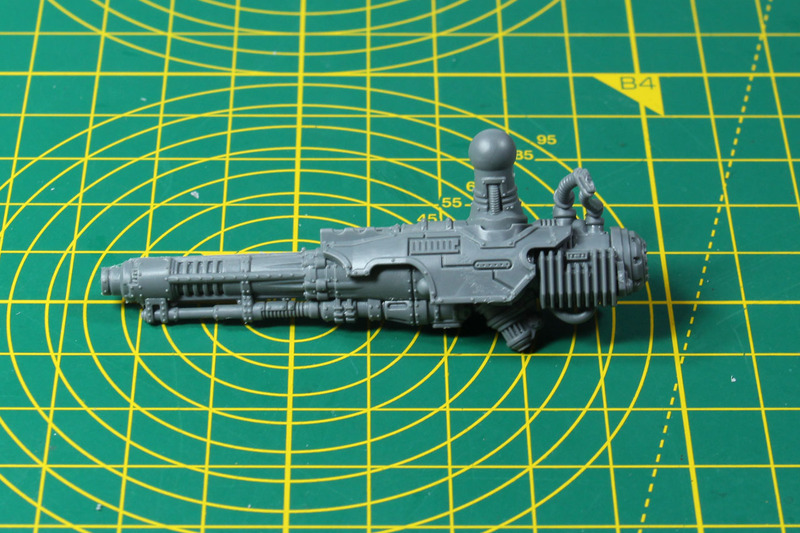 As for the final built, I went with the close combat weapon on the left and the guns on the right. You could easily put a magnet into the ball and joint connection to have a modular weapon load out. 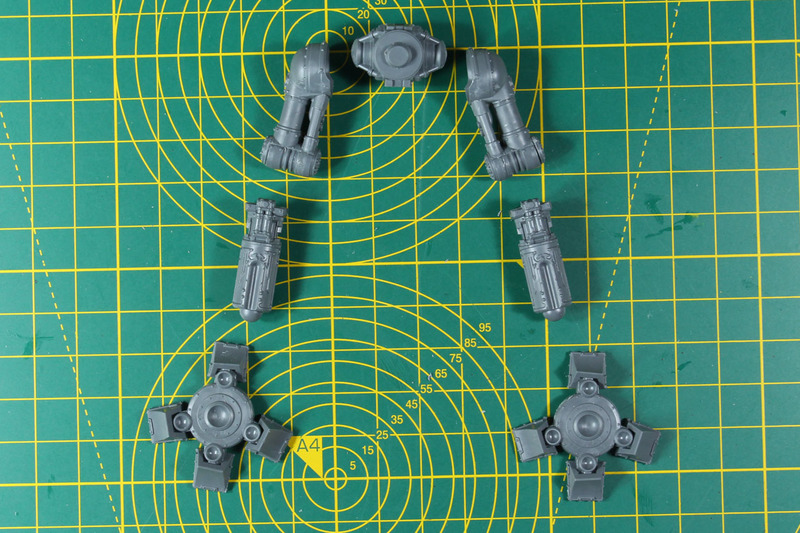 Of course you can mix and swap the weapon systems from both Reaver kits with eachother, as they use the same ball joints / connecting pieces. As you can see above, the pipelines connect to the back part of the power plant, therefore the last part of armour on the body itself is added in the step after that. This might create a small gap, that you can take care of with a bit of liquid green stuff or "welding" with plastic glue. 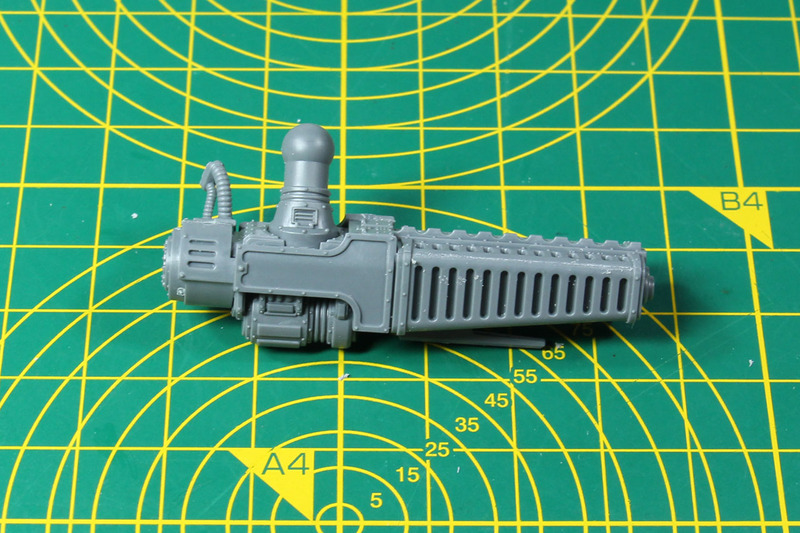 Just be aware the for the right arm, there is only one connecting piece, so if you magnetize the weapon, that part will need to be glued to the torso, having the connection piece along the pipeline. For the last parts, the shoulder pads. These are available in three different designs, with the Eye of Horus, with the Opus Titanicus and a blank pair. I mentioned it above, this Reaver will serve his duty with a traitor legion, so I went with the Eye of Horus on the shoulders. 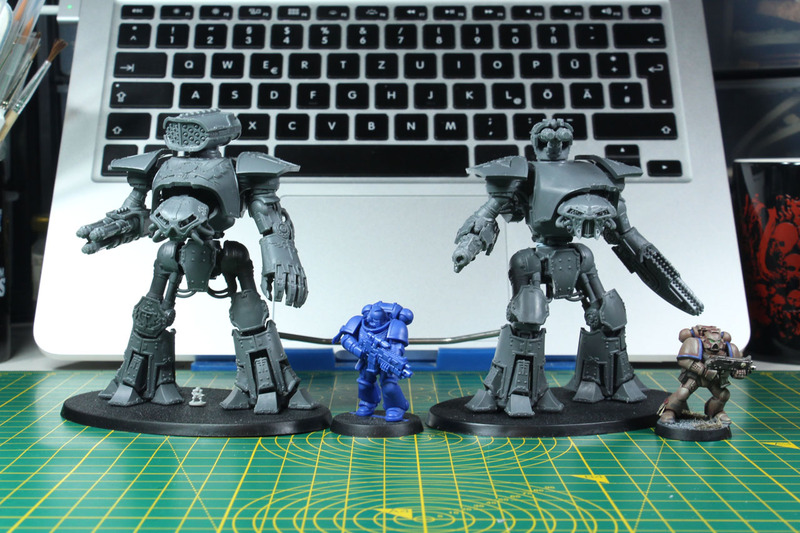 A brief size comparison in the middle between Warhound Scout and Warlord Titan, along with a second shot next to the other Reaver, a regular und a Primaris Space Marine, as well as an old Epic Ork Boy. 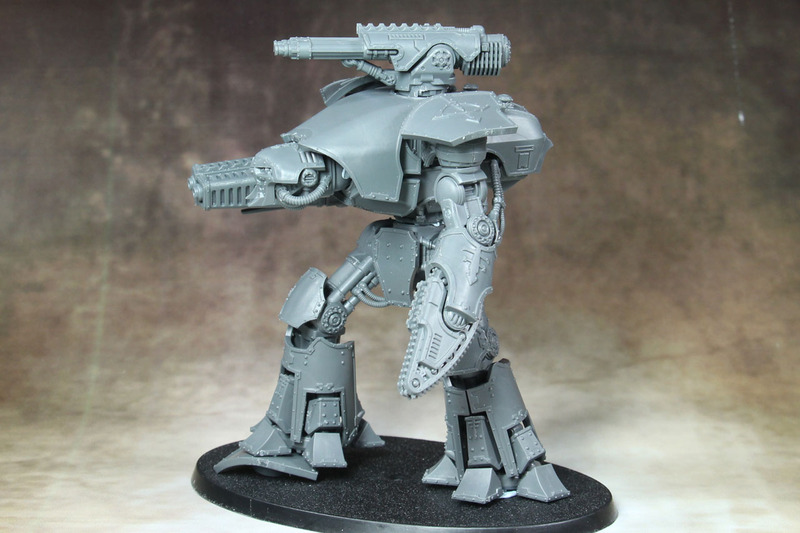 As the Warhound, the Reaver is available as a 28mm resin kit for the Warhammer 40.000 range by Forge World too, starting at 355 EUR. 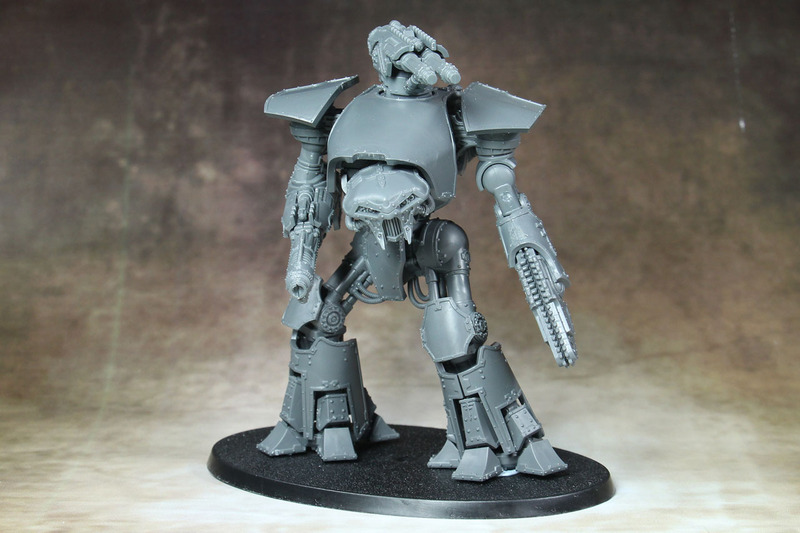 The Chaos variant of the Reaver is available as well, and I really like the sinister look of the kit. 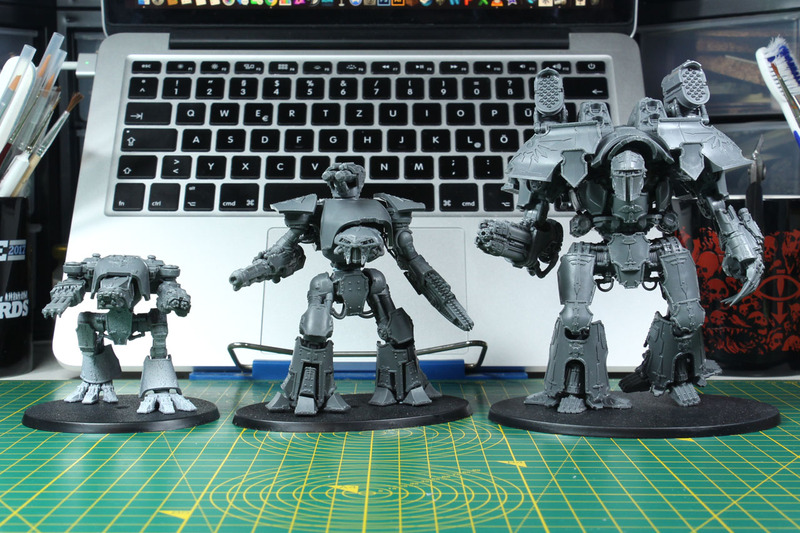 A 28mm Reaver is four times taller than the Adeptus Titanicus kit. 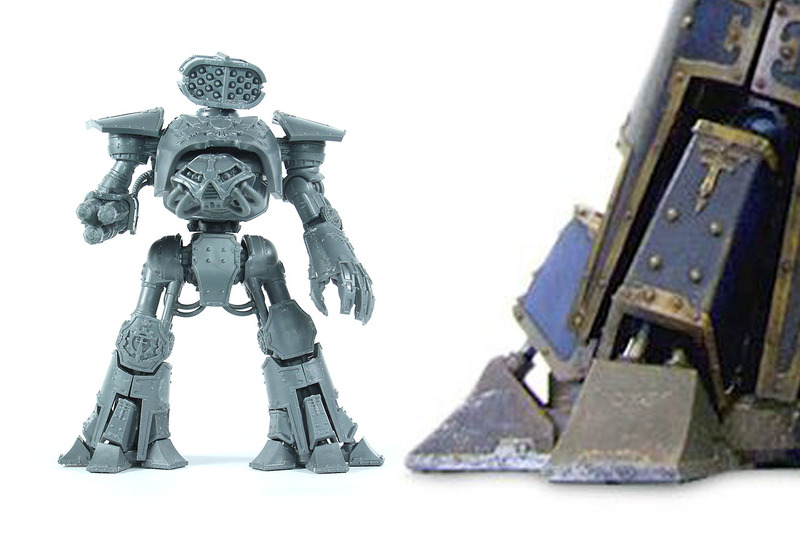 We continue with the newly invented Titan-benchmark euro per inch ratio, the Adeptus Titanicus Reaver beats the Forge World Reaver with 11,25 EUR/Inch (45 EUR for 4 Inch) to 52 EUR/Inch (834 EUR for 16 Inch). 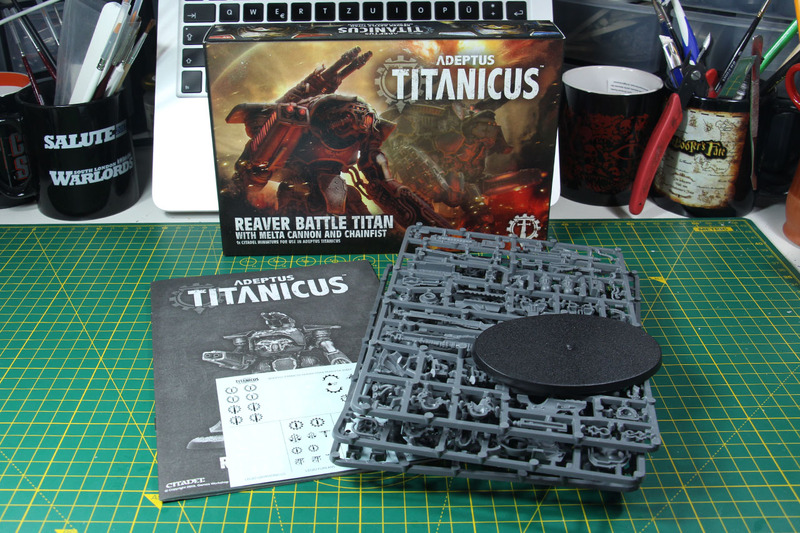 Interesting to see, that the price of the Reaver and Warhound is so close to each other with 11,25 and 11 EUR/Inch in the Adeptus Titanicus scale, and similar in the Forge World pricing of 52 to 44 EUR/Inch. 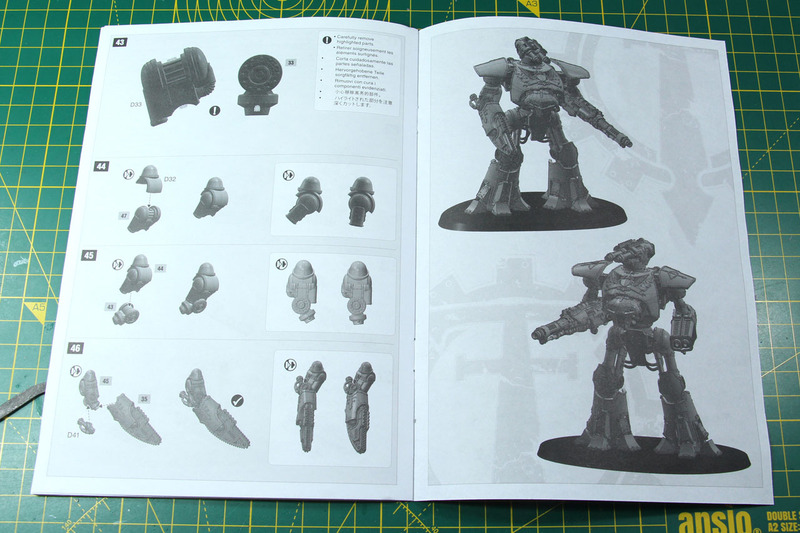 And to conclude the pictures in this review, showing the final build Reaver with the Volcano Cannon and blank shoulders. 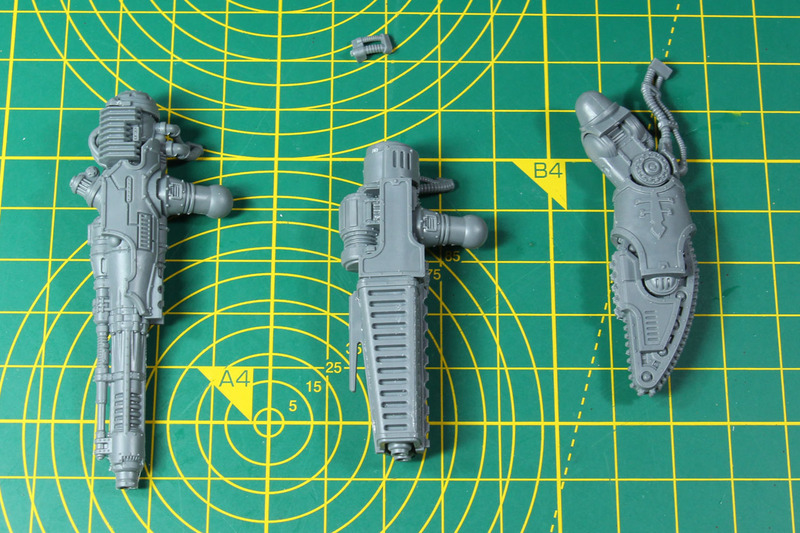 As well as another stance, wielding the Melta Cannon and Horus shoulder pads. 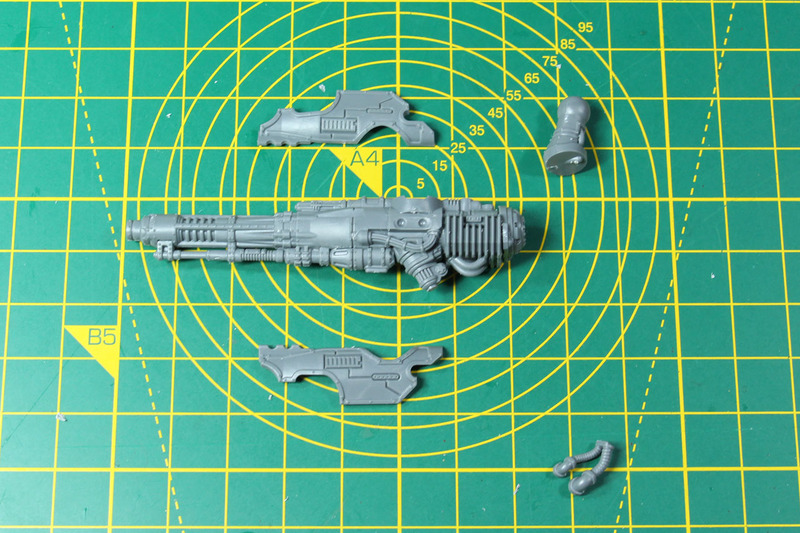 This kit adds a solid amount of additional / new options to the Reaver kit, using a dense alternative sprue for the weapon and head options. 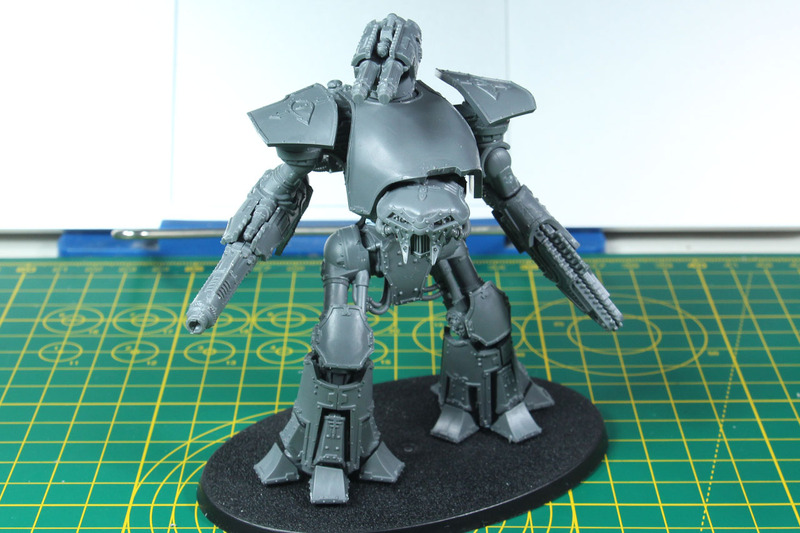 I am glad, that they released this second kit for the Reaver, as the regular Mars Pattern has a very faithful, loyal design to it and that - at least to my opinion - doesn't work that well with traitor legions. This has a more sinister look at it. Still, not as feral as the Chaos Reaver, but on a good way towards that end of the spectrum. 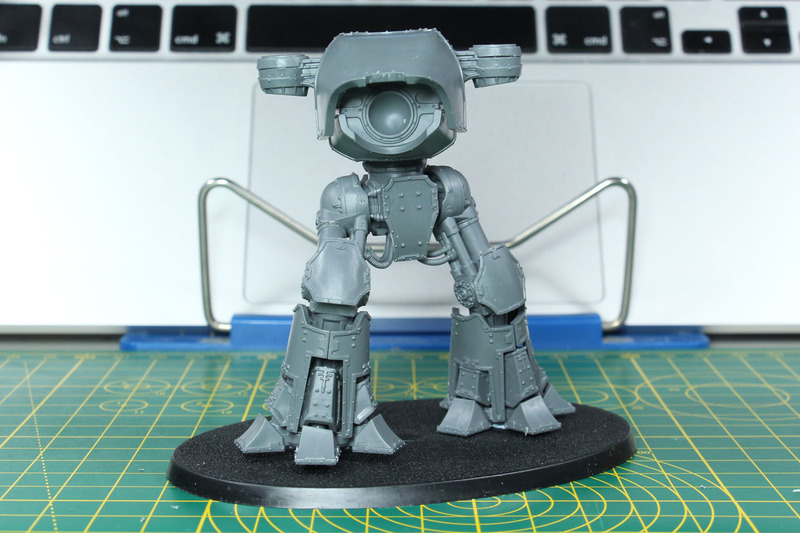 It is going to be interesting, where the range moves on after this, as there are not that much of spoilers around, what is coming next for Adeptus Titanicus. 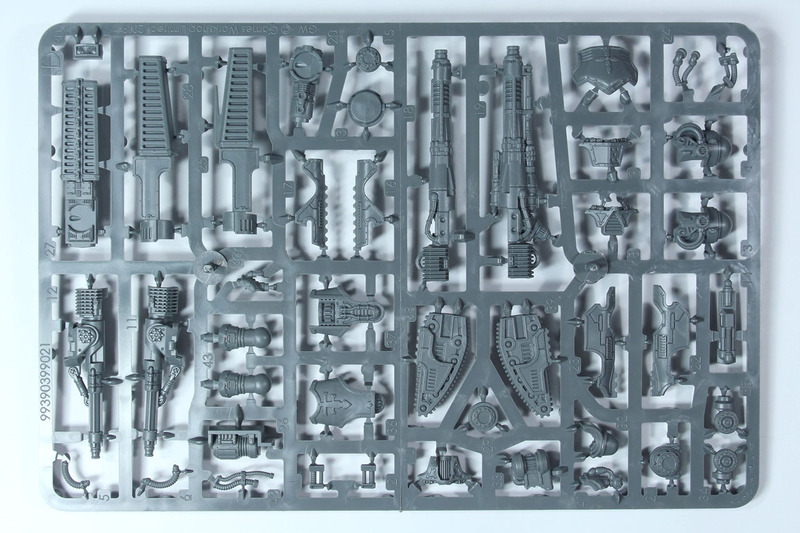 The Titandeath supplement adds new maniples and legions, and with the Warlord Weapon sprue being sold individually and this kit, you have quite some options for the two (current) top tier titans. 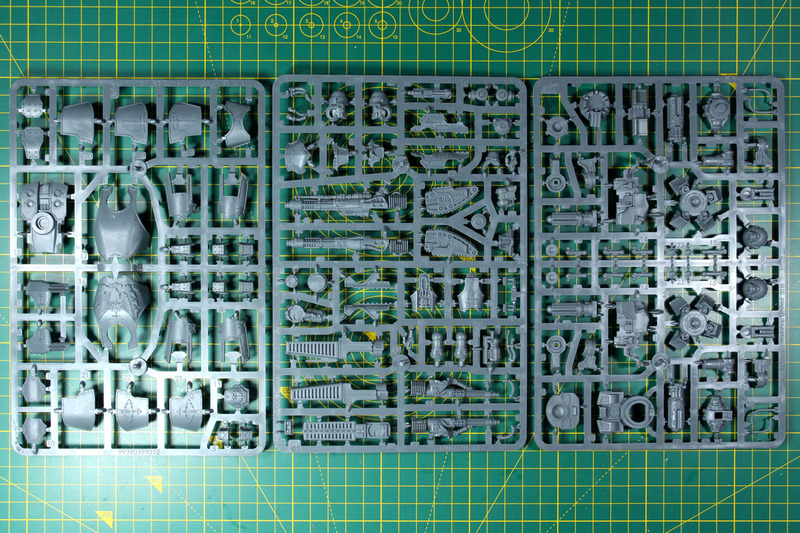 As sprue D is tightly packed with content, there was no space wasted, that could have covered additional parts, so no critizism on that part. 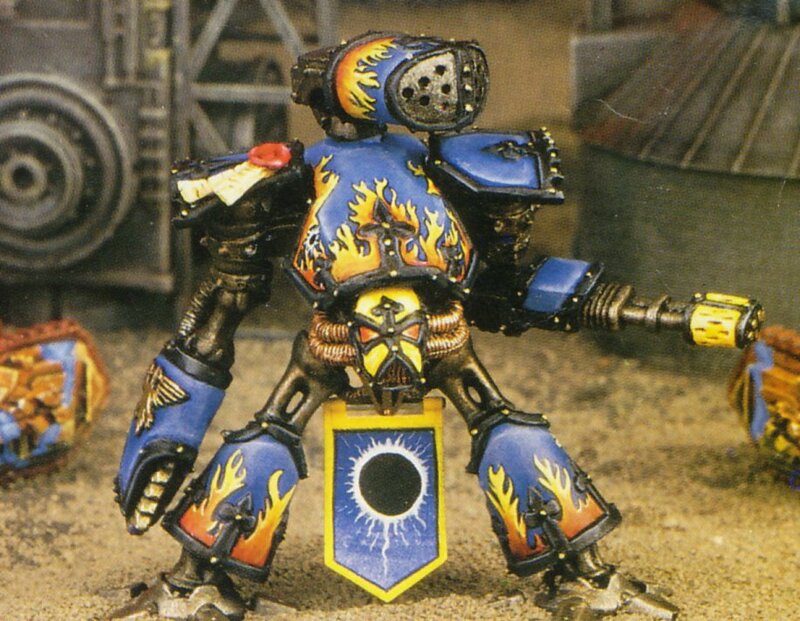 Still, I would have loved to see claw fingers for the Reaver's power fist, but maybe we will see something like this from Forge World, depending on how successfull Adeptus Titanicus is or what their plans are. 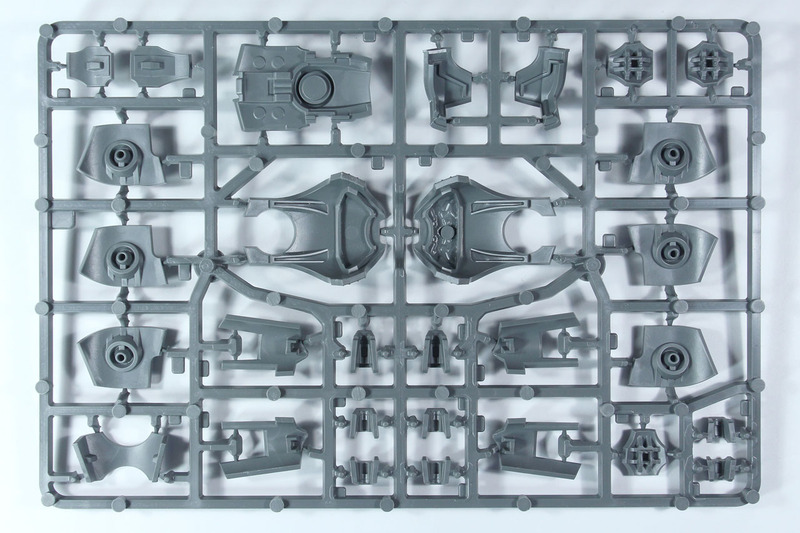 It is likely, that the new sprue will be available as an individual item, like the new sprue from the second Warlord Titan kit, in a couple of weeks. 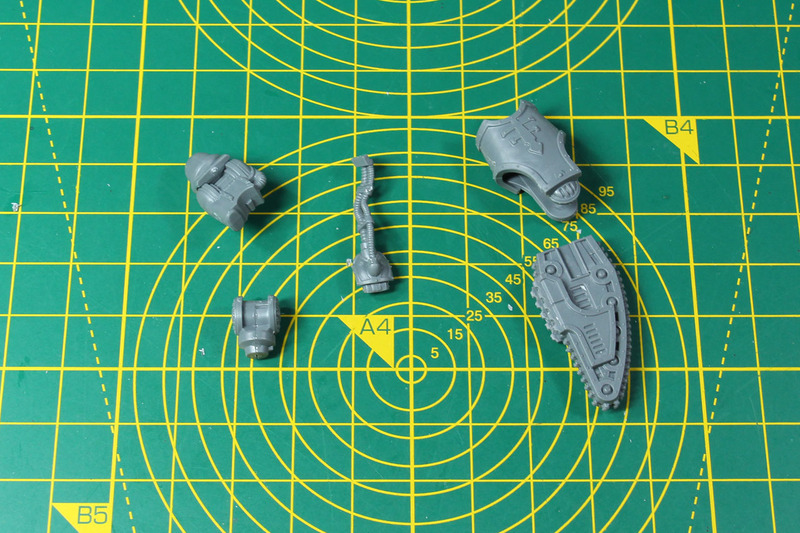 With its price and size, the Reaver kit fits in the middle between the newer Redemptor Dreadnought (55 EUR) and Ork Deffdread (39 EUR), so price tag of 45 EUR is fitting within its size class. As taken from on of the Warhammer TV Twitch episodes, Adeptus Titanicus is meant to stay within the time period of the Horus Heresy. 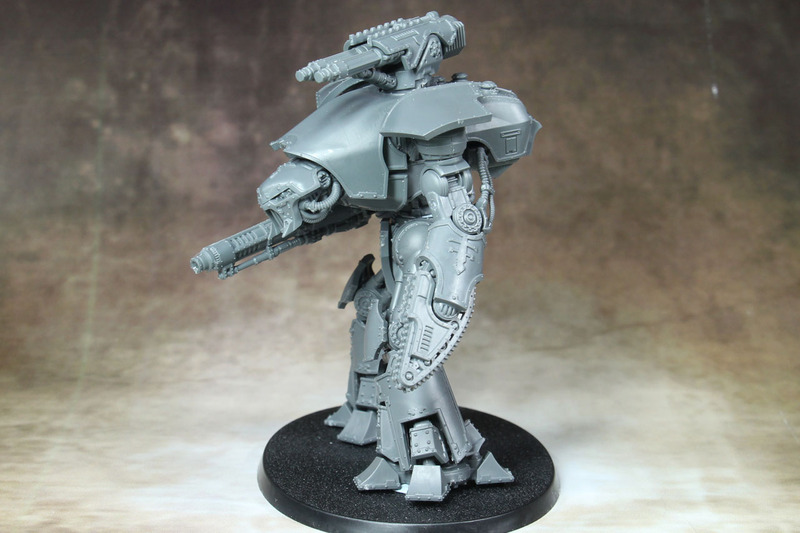 So this means no xenos titans planned for the near future. Unless the game would grow much more popular and therefore a bigger market for adding further products. Same goes for terrain kits. Still, that gives us no definite answer on weither we're going to see Warbringers or Emperor titans. 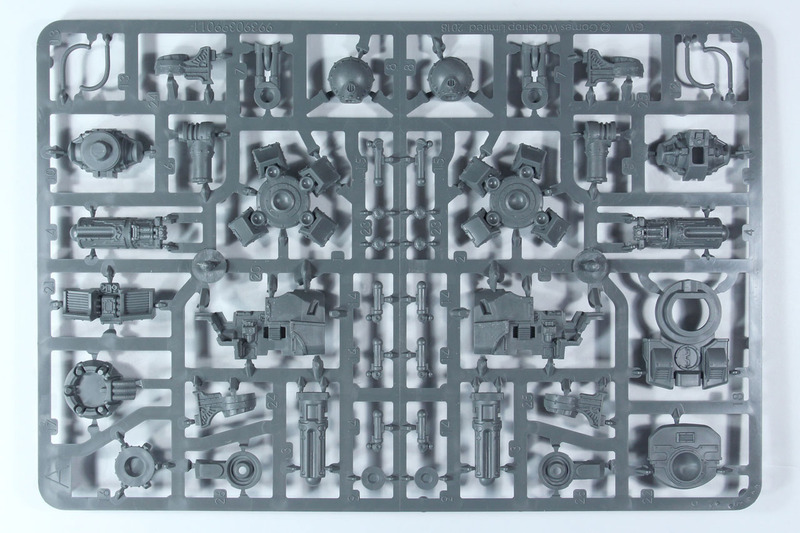 And I assume that Forge World still has a lot in their queue for Blood Bowl and Necromunda, that might have a higher priority compared to possible Adeptus Titanicus products / additional parts. Warhammer 40.000 and Adeptus Titanicus are brands by Games Workshop.